Cities Can Sue Big Banks Over Effects Of Discriminatory Practices, Supreme Court Says : The Two-Way The city of Miami can sue Wells Fargo and Bank of America for damages caused by allegedly discriminatory and predatory lending practices, the Supreme Court says. People walk in front of a Wells Fargo branch on Sept. 9, 2016 in Miami, Fla. On Monday, the U.S. Supreme Court ruled that the city of Miami can sue Wells Fargo and Bank of America under the Fair Housing Act for damages caused by allegedly predatory and discriminatory lending practices. 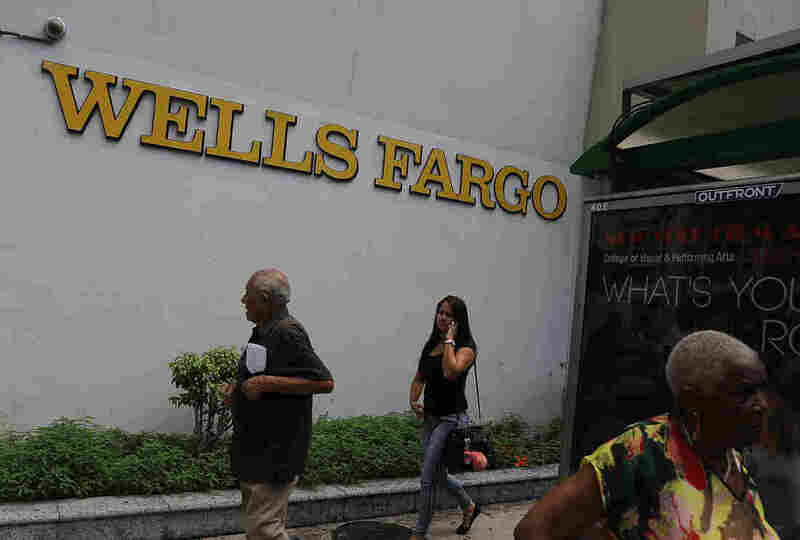 The city of Miami can sue Wells Fargo and Bank of America for damages under the Fair Housing Act, the Supreme Court says, allowing a lawsuit to continue that accuses the big banks of causing economic harm with discriminatory and predatory lending practices. The 5-3 vote saw Chief Justice John Roberts form a majority with the court's more liberal justices. Justice Anthony Kennedy, widely seen as the court's "swing" justice, sided with Justices Clarence Thomas and Samuel Alito. The court's newest justice, Neil Gorsuch, wasn't involved in the case. After lower courts had issued back-and-forth opinions on whether Miami's lawsuit should continue, the Supreme Court says the city should be allowed to make its case. "But the justices said that to win damages, the city must prove a direct link to the revenue loss and increased costs," NPR's Nina Totenberg tells our Newscast unit, "and that is an extremely high bar to clear." The ruling comes nearly two years after the Supreme Court sided with civil rights groups who argued that, as we reported, "claims of racial discrimination in housing cases shouldn't be limited by questions of intent." Miami accuses the banks of targeting African-American and Latino customers with predatory lending practices from 2004 to 2012 that led to foreclosures and vacancies in minority neighborhoods. In addition to frustrating the city's efforts toward racial integration, Miami says, the foreclosures prompted a number of negative effects, from crippling property values and tax revenues to putting a burden on the city to service blighted and unsafe properties. "We hold that the City's claimed injuries fall within the zone of interests that the FHA arguably protects," the majority opinion states. "Hence, the City is an 'aggrieved person' able to bring suit under the statute." The Eleventh Circuit court had ruled that Miami's damages were foreseeable, citing that as the standard to establish a direct cause-and-effect line between the banks and the damages. But the Supreme Court said the lower court had "erred in holding that foreseeability is sufficient to establish proximate cause under the FHA." "The housing market is interconnected with economic and social life. A violation of the FHA may, therefore, ' "be expected to cause ripples of harm to flow" ' far beyond the defendant's misconduct. Nothing in the statute suggests that Congress intended to provide a remedy wherever those ripples travel. And entertaining suits to recover damages for any foreseeable result of an FHA violation would risk 'massive and complex damages litigation.' "
The Supreme Court ruling declined to determine the "precise boundaries of proximate cause" under the FHA — something the parties in the lawsuit had requested — calling instead for the lower courts to do so. In the dissenting opinion, Justice Thomas wrote that Miami had drawn a thin line connecting the alleged FHA violations to the injuries the city had suffered, saying that other events might have played a role. "Under Miami's own theory of causation, its injuries are one step further removed from the allegedly discriminatory lending practices than the injuries suffered by the neighboring homeowners whose houses declined in value. No one suggests that those homeowners could sue under the FHA, and I think it is clear that they cannot."